> TEOTWAWKI Blog: Zombie Weaponry Contest Entry #21 - the last one!!! Zombie Weaponry Contest Entry #21 - the last one!!! Thanks to everyone who entered our contest--impressive! Good turn out. We're looking to do some similar contests in the future and have some exciting things in the works. Stay tuned. -1 48" short bow: in the Land of Zombies grabbin a quick meal at the drive through isnt gonna be an option, and arrows can be readily adapted from materials.Gotta save my bullets for the undead. -Kukri machete: chopping work, and melee weapon. -SOG Fasthawk: backup for the Kukri. -.22 Henry Survival Rifle: a self-contained semi-auto rifle that's accurate, utilizing cheap and plentiful high-velocity ammo.It's no AR, but its what I have if I had to grab and go, and I'm glad it's there. -quiver from buffalo hide for arrows and longer weapons; a gift from an aunt who was a collector, and very well made. -Cold Steel big bore blowgun, pulling double-duty as small-game alternate to the bow, and walking staff when assembled. -Filipino Panabas: For the bigger zombies, when its necessary to swing away with both hands. More pictures and gear after the jump! 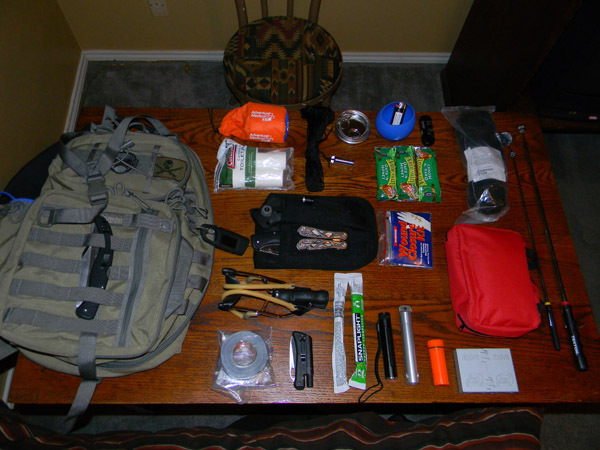 -Emergency Bivvy: for when you get caught in a spot and have to make do for a night. -Camp Toilet Paper: even one-ply is better than making do when you gotta "make do"! -400lb test-weight nylon cord with micro grappling hook at the end for retrieving items in hard to reach places. -Wire saw in candy tin. -Granola Bars...many more than are pictured. -Paracord, for all of it's many wonderful uses. -Extendable mirror and 8lb test-weight magnetic retriever...for seeing around corners and out of hiding spots, and snatching useful items that would prefer to remain hidden. -First Aid kit. "it" happens. -Wound Closure kit. for when "it" happens a little deeper. -Pocket Grappling Hook: for line-casting and retrieving larger items. -Inova Flashlight: for shining light into dark places. -Glowsticks: for leaving dark places lit. 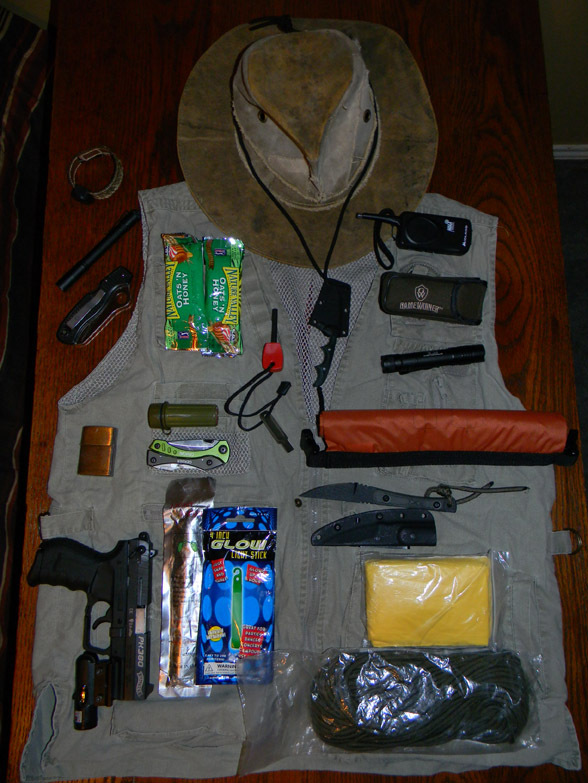 -Gerber pouch with Gerber Multitool, Gerber sliding saw, gerber flashlight, and Cold Steel Vaquero Grande (serrated). 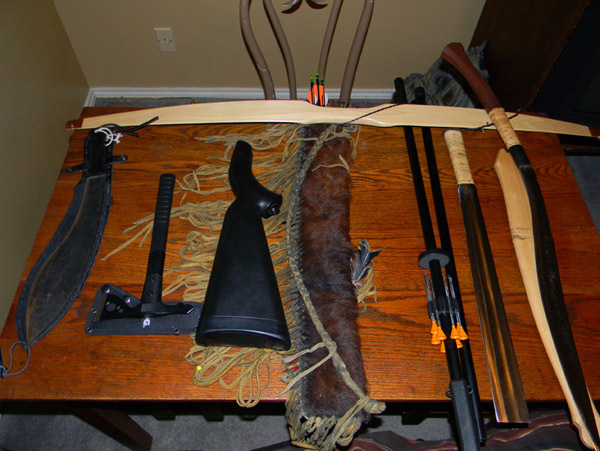 -Slingshot, as backup to bow and blowgun: anything that can fit in the pouch can function as ammo (within reason). -Ducttape: the original Band-Aid...it fixes pretty much darn near anything. "Pic3": On the Belt, On the Vest, In my pocket or on my Head! -"Real Deal" Canvas hat....pretty much the coolest and most durable piece of headgear I've ever owned: to reduce exposure. -Rothco Safari Vest: what it lacks in initial quality can be reinforced with good thread, and makes up for in number of pockets. -Spyderco Rescue Serrated: the first thing that goes into my pocket every day. -Turtle-shell compass on snake-skin bracelet. -CRKT Folts Minimalist-Around the neck as a "last ditch" tool. -Monocular: for seeing it coming from a long way off. -NOAA weather radio: for knowing when the break out the poncho until the last anchorman becomes snack-food. -Walther PK380. If youre wondering about why the dinky airsoft laser, it's not for pinpoint accuracy. If zombies are basically virus-spreading morons, why not have some fun and have them chase a red dot into a wall? Not like there's gonna be a bunch of domestic animals around to mess with anymore.